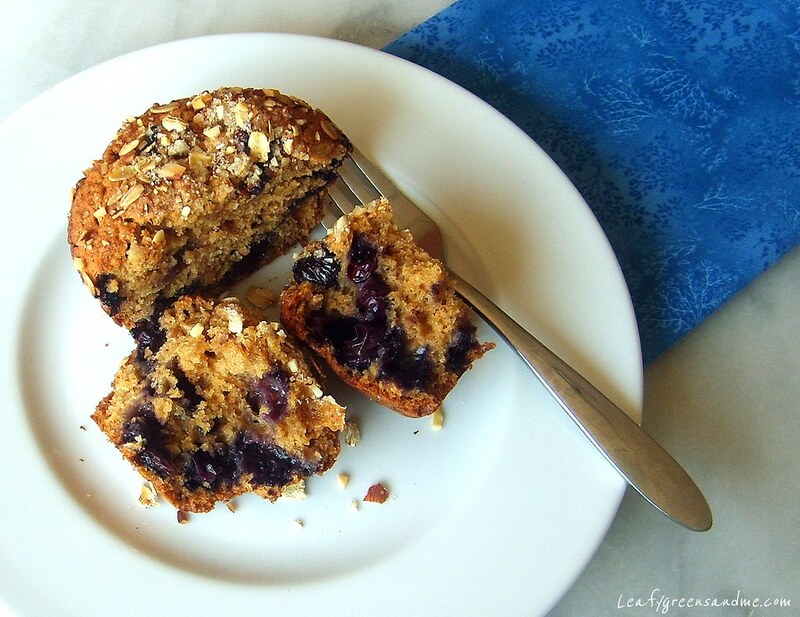 What do you do when you wake up in the morning and have a craving for blueberry muffins and you don't want to go to the grocery store? Well, you raid your pantry and fridge and come up with a crazy concoction of flours, nuts, grains and oils to make your muffins. I was a little worried at first about the outcome, but surprisingly they turned out really great and now my husband and I are stuffed. You don't need to use two different flours and two different kinds of fat for your muffins, but this is all that I had in my pantry. 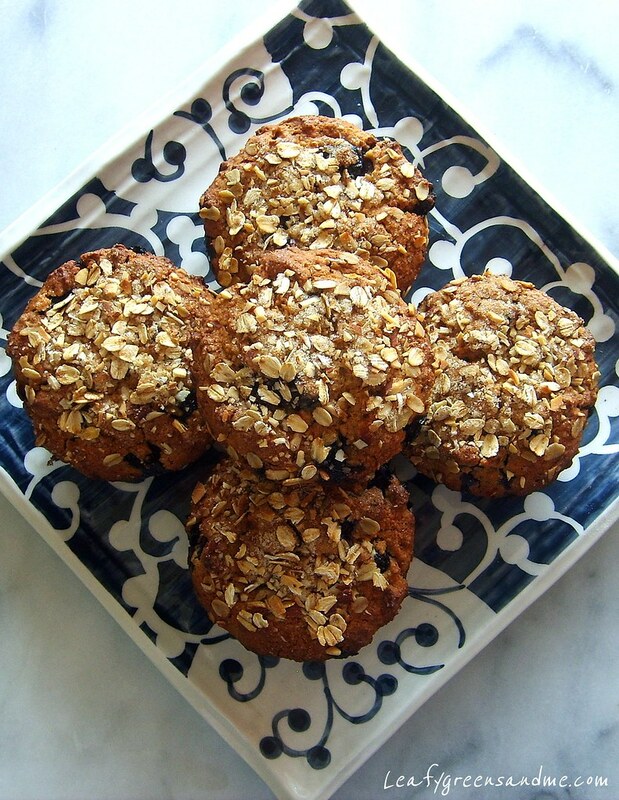 You can make your muffins using just whole wheat pastry flour and Earth Balance Buttery Sticks instead. Either way they are going to come out delicious! Preheat oven to 400 degrees and position oven rack in the center of the oven. Lightly spray a 6 cup muffin tin with canola spray and set aside. In a small bowl, prepare almond-oat topping and set aside. In a medium size bowl combine flours, ground almonds, oats, baking powder, salt and lemon zest and stir well to combine. In a food processor or blender, add ground flax and water and blend until creamy. With motor running, add agave syrup, almond milk, vanilla extract, melted Earth Balance and canola oil and blend until combined. Pour mixture into a large bowl and stir in flour mixture until just combined. You may still see a little flour visible and then gently fold in blueberries. With a large spoon, scoop batter into muffin tin, filling almost to the top and sprinkle with a tbsp of the almond-oat topping. Bake in the oven for 35-40 minutes, turning half way through the cooking process. Also, when you get to the half way point, turn the oven temperature down to 350 degrees. The muffins are done when a toothpick inserted in the center comes out clean and the edges of the muffins are golden brown. Remove tray from the oven and place on a cooling rack and cool for about 10 minutes. Run a pairing knife around the edge of the muffins before removing from the tray. Tanya, what can I sub the earth balance and the canola oil? Or coconut oil? Can I use apple sauce and olive oil? If so, how much? Also, if I don't have spelt, could I use whole wheat pastry flour for to replace the spelt? Would love to see you try to make this gluten free! Anna, You can try substituting olive oil; however, I would use a light-neutral tasting olive oil. You could also try substituting with flax seed oil and grape seed oil. I have never used applesauce to replace oil, but I have used it to replace eggs. I'm sure that it would work out fine. Just might cause the muffin to be denser in texture. I would start out using a 1/2 cup oil and 1/3 cup applesauce and see how it comes out. Yes, you can use all whole wheat pastry flour instead of spelt. I didn't have enough of either flour and so use a combination. The grain would of probably been a little finer if I would of used all pastry flour. Hope this helps!